Cloud Tiger - "Songs from the Gate of Tigers"
I met local Columbus artist Cloud Tiger at the recent Quarkstock 2000 event, and she gave me a copy of her recent CD. Though there's no liner notes to speak of, I got the impression from the autobiographical statements made on the disc that she had recorded the entire album in her bedroom on a 4-track. Most of the 12 songs are somewhat thinly composed, a mixture of various keyboards (synths, piano, synth-bass (? ), and incidental sounds) and percussion, including 'real' drums on many tracks. Hence, much of the focus is on Cloud Tiger's lyrics and poetry. Her delivery is as varied as the songs themselves... everything from opinionated ranting to semi-spoken lyrical poetry to her natural soprano singing voice. "Living with the Bends" is one of the sparsest pieces being only a deliberate drum track and whispery spoken vocals. I got the feeling the lyrics were about the pains of a failed relationship, but I was attracted more to the subtle timbre shifts (intentional I assume) in the drums. And I liked the contrast between the starkness of this track and the rich and lyrical "Island Song" that immediately follows. Here, Cloud Tiger debuts her beautiful natural voice over the intertwined melodies of piano, synth, and bell sounds - very nice. Later on, she performs the melancholy "Lomir Sich Iberbeten" in similar voice - what I gather is a traditional Yiddish song, though she sings "Let Me Love You" in there somewhere (perhaps a literal translation?). In another directional twist, her voice goes into Torch Song territory for the sultry "Love Looks Down," here backed by what appears to be upright bass and drums. These are all sprinkled around a mix of introspective and/or extroverted spoken pieces and a melancholy solo piano piece ("The Moon and You"). About midway through the album, the bizarre "Angel Trains" appears and threatens to conjure up the dreaded 'P' word. Pretentious or not, a little eccentricity has its charms; the problem for me was that I just didn't get what it was about. "The Macaroni Song" is even moreso a 'novelty' bit, rappish vocalizing over a funky beat, reminding me of some of the performance art/prog-rock of Pittsburgh's Squonk Opera. I pretty much agreed with all of the commentary (e.g., "Record labels do not create music, artists do!") of "A Little Speech on Music You Don't Need," though the concept of 'preaching to the converted' came to mind. The finale, "WOMANHOOD!!" I knew was going to be a problem though. Not because of the viewpoint necessarily... but the all-caps and double exclamation point is a big giveaway that it's gonna be a lecture. :) Actually, in the end it was the techno beat that turned me off the most, and anyway I wasn't sure if the feminist propaganda was meant to be serious or sarcastic. 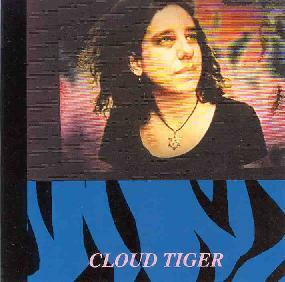 A websearch for 'Cloud Tiger' told me only that Cloud Tiger is a fan of Jeff (son of Tim) Buckley, the singer/songwriter/poet who (just as his father did) died young in tragic fashion. I also learned that she has (at least recently) been in the Performing Arts (specifically, dance) department here at Ohio State University. That makes perfect sense, as I get the impression that we're only getting half the picture here of Cloud Tiger's artistry, and that there should also be a visual component going along with the music. As a purely musical work, 'Songs from the Gate of Tigers' is amazingly varied, fearless - at times way over the top (not always a bad thing), and I enjoyed about half the songs. At some points the synths and incidental sounds give off kind of a cosmic flair, but moreso the connection to the space rock community would be just as other Earthbound poets like Gilli Smyth (Mother Gong), Thom Woodruff, and Cleveland's Gaia Avatara. After all, the Earth is a planet too. Contact Cloud Tiger at: cloudtiger6@hotmail.com. Songs From The Gate Of Tigers is available through Cdbaby at: http://www.cdbaby.com/cd/cloudtiger.